For the “Chef-at-Heart”: Custom-Designed Outdoor Kitchen – hosts and hostesses who love to show off their culinary skills will delight in a space that’s well-suited for entertaining while grilling, sautéing, slicing, dicing and schmoozing. From a built-in stainless steel grill with stacked stone surround and granite-topped workspaces to a Mediterranean-inspired wood burning pizza oven enveloped by a pergola draped with climbing vines and a mosaic tile-topped bar for your “cooking show” audience, this space can be anything we decide to cook up together. 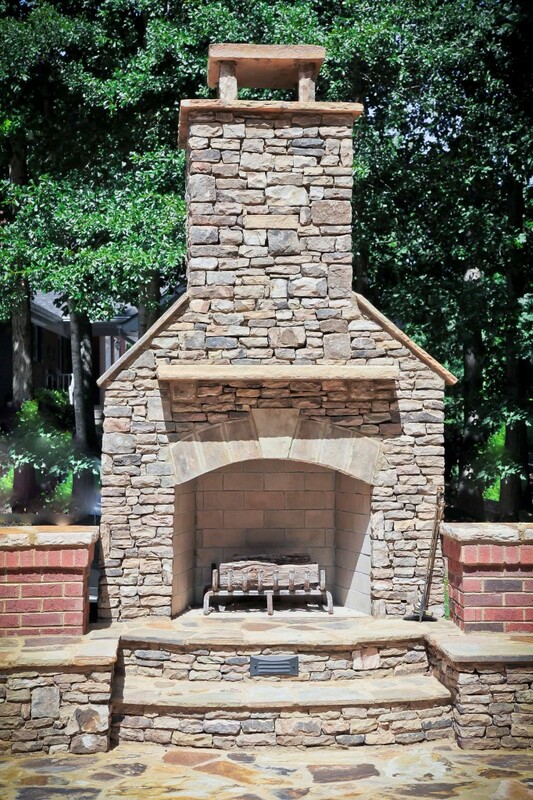 For the “Soulful Storyteller”: Outdoor Hearth With Deep Seating – there are those homeowners who like to hold court when they have guests (you know who you are). They may be excellent storytellers who enrapture their audience with tales from their youth or regular stand-up comedians who leave their spectators doubled over from all of the belly laughs. A showplace hearth surrounded by cozy deep seating sets the stage beautifully for countless nights spent spinning yarns. For the “Playful Spirit”: Resort-Inspired Pool Deck – Who wouldn’t love to stay on a permanent vacation? With a custom designed pool deck and outdoor pool, you can evoke the sense of a resort right in your backyard! You can determine whether you’d like to keep it sporty with a classic lap pool, fun with unusual shapes and special features such as a dive board and/or slide, or luxurious with a slate deck and waterfall feature. No matter which theme you opt to pursue, you’ll be shocked to learn how many friends you have once you put in a pool. For the “Peaceful Soul”: Tranquil Oasis with Water Feature – Some homeowners opt for a space that’s all their own – an escape from the world of texts, e-mails, phone calls, bills and rush hour traffic. A beautifully designed and realized oasis with water feature could become your favorite “room” of the house. Some well-placed shade trees and a koi pond with benches at the water’s edge or a tropical paradise filled with palm trees, a hammock and a gentle waterfall are just a couple of ways to pursue your open-air haven from the rat race beyond your high wooden privacy fence. For the “Natural Nurturer”: The Garden of Your Dreams – For those homeowners who feel at one with the Earth when they’ve got their hands in the dirt, a backyard is simply a blank canvas for the garden of your dreams. From a traditional English Garden to a whimsical wildflower wonderland, you can fill your outdoor living space with your favorite annuals and perennials, as well as a well-placed garden bench, a pathway lined with stepping stones, a fountain at the heart of the garden, a charming potting shed… anything your heart desires. The visionary design-build team at Highlight Homes welcomes the opportunity to help you bring your personality OUT with an outdoor living space renovation. Call us TODAY for a no-obligation consultation at 678-873-9234 or e-mail us at info@highlighthomesga.com. To learn more about Highlight Homes and sneak a peek at our online portfolio, pay a visit to www.highlighthomesga.com. If you’d like to stay up-to-date on the latest renovation trends, company news, and monthly special offers, be sure to “like” us on Facebook!